Friday, 17 March 2017. 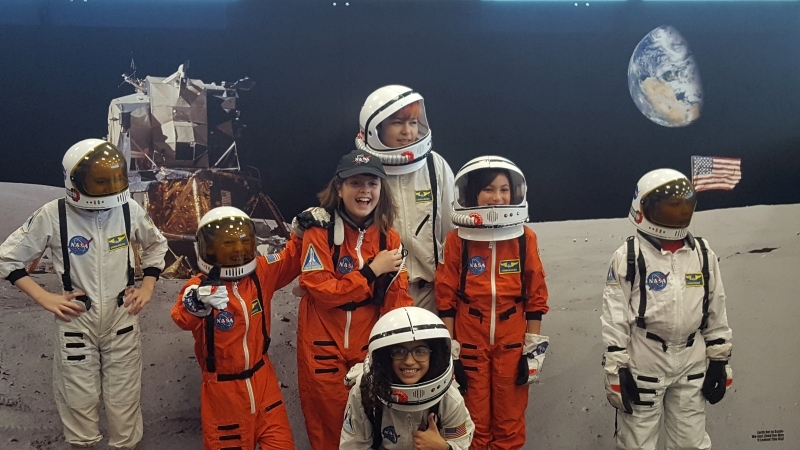 Searching not for leprechauns but for knowledge of space exploration, nine of our twelve students in grades 3-8 visited the Museum of Space History in Alamogordo. Teachers Elizabeth Brasher and Ellen Armitage led the group, along with Shawn Armitage. This small museum is packed with the information that gives the real human feel of space programs by astronauts and cosmonauts, as well as of the scientists and engineers who conceived of space travel, rocket physics, complicated trajectories in space, and the human factors, even how bodily functions are accommodated in space suits. The group left the school at the start of our school day and spent the whole day at the museum, returning near 3:30, full of stories.